After 17 holes, Woods had a two-shot cushion and ultimately needed to only tap in a two-foot, uphill bogey putt to secure the green jacket. 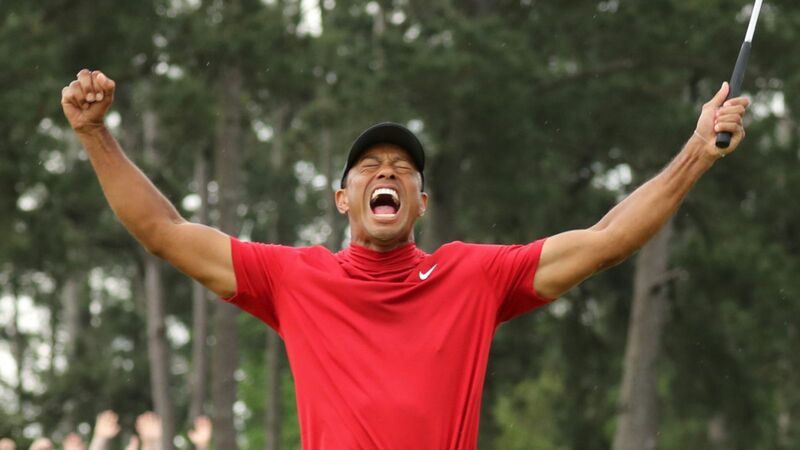 Tiger fans have been waiting for this for a while: Tiger’s quest to catch Jack’s record of 18 major victories is officially back on and the chances of a 2019 Grand Slam for the sport’s biggest star are very much intact. Get ready for non-stop Tiger Woods news for the foreseeable future! Tiger’s victory nearly didn’t happen thanks to an ardent security guard who slipped and nearly took him out on the 14th hole on Friday afternoon. The incident occurred after Tiger had scampered to his right to get a better view of the incredible recovery shot he had just hoisted over a tree and onto the green from the left rough. In an effort to maintain control over the encircling crowd, the security guard rushed in but slipped on some slick grass and collided with Tiger’s ankle. Tiger didn’t see it coming and started hobbling immediately, causing the golf world to temporarily hyperventilate. Fortunately, he shook it off, regained his composure and then sank this 15-foot birdie, unleashing an iconic fist pump the moment his ball found the bottom of the cup. In a sense, it really was freaky Friday at this year’s Masters. In addition to the assassination attempt on Tiger’s ankle, fans also witnessed a bizarre moment involving Zach Johnson on the 13th tee. The 2007 Masters champion was taking some practice swings while waiting to tee off when he clipped his ball in his downswing, causing it to ricochet off the tee block to his right and land approximately five feet in front of him. Unsure of what he had just done, Johnson turned immediately to his caddie and playing partners with a combined look of confusion and horror. Over the years, the ball-skip challenge on Augusta National’s 16th hole, Redbud, has become must-see television. Not only is the gallery super into it, but it has also produced a trove of highlights, including, most famously, Vijay Singh’s astonishing 5-skip ace there in 2009. Prior to the first round, The Masters YouTube account released a video about the unique tradition that featured golf scientist and physics major, Bryson DeChambeau, explaining some of the physics involved in the shot. We’ve probably watched the video 10 times by now and still have no idea what he’s talking about, but he certainly sounds brilliant describing it! Moving Day truly earned its nickname this year with 20 of the 65 players who made the cut recording scores of 69 or lower on Saturday. Leading the way was the trio of Patrick Cantlay, Webb Simpson and Tony Finau, who each shot 8-under 64s to vault up the leaderboard. It was the first time in Masters history that two players—let alone three—shot scores of 64 or lower in the same round. Cantlay was the first to post his 64, carding four birdies each on the front and back nines to move up 36 spots into a tie for 14th. Simpson followed suit a few hours later, doing it in a completely different way. The Raleigh native started out slowly offsetting a birdie on the second hole with a bogey on the 6th, before catching fire with a string of four straight birdies on the 7th hole, an eagle on the 13th and two more birdies coming down the stretch. That spectacular 12-hole run propelled him 24 spots into a two-way tie for 5th place at the end of play. Tony Finau’s 64 was arguably the most impressive of the group because for a while it looked like he could become the first player in Masters history to shoot a 62. The lanky 29-year-old came out of the gate with three birdies through his first three holes, made another one on 6 and then hit his second shot on the par-5 8th to a mere 8 inches for an easy tap-in eagle! Although it looked like Finau was going to run away with the tournament at that point, he only notched another two birdies during the remainder of his round. Nonetheless, his stellar and unblemished round moved him 14 spots into a two-way tie for third with Tiger Woods. In all, 10 players jumped double-digit spots on Saturday and anyone who watched the action would agree that it made for excellent television! There were some remarkable shots at Augusta National last week but none better than the pair of aces we saw in the final round on the 16th hole from Justin Thomas and Bryson DeChambeau. Incredibly, it was the first hole-in-one DeChambeau has ever made!